The state expects to buy the Essex Chain of Lakes this year. Photo by Carl Heilman II. The state is on track to buy more than nineteen thousand acres of former Finch, Pruyn lands by the end of the year, according to the state Department of Environmental Conservation. Karyn Richards of DEC’s Division of Lands and Forests outlined the department’s plans to the Adirondack Park Agency on Thursday afternoon. 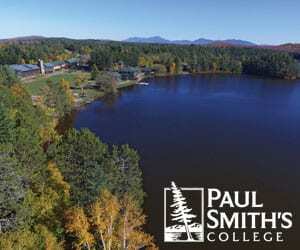 Over the next five years, she said, the state will purchase sixty-nine thousand acres from the Adirondack Nature Conservancy for $49.8 million. The land will be purchased in four stages and added to the forever-wild Forest Preserve. In the first stage, DEC will acquire the 18,318-acre Essex Chain Tract and the 944-acre Outer Gooley Tract. The larger parcel contains a series of connected ponds for paddling. The smaller parcel is located at the confluence of the Hudson and Indian rivers and will serve as a takeout for trips down the Hudson starting in Newcomb. All told, the lands to be acquired in the first stage contain eleven lakes and ponds, 14.7 miles of Hudson shoreline, and 8.5 miles of Cedar River shoreline. However, even if the state buys the land this year, most of it will not be open to the public until next fall. When the Nature Conservancy purchased the Finch, Pruyn lands, it agreed to allow hunting clubs to continue leasing tracts of timberlands through 2018. The annual leases can be modified to allow public access; however, in the case of the Essex Chain Tract, the changes in the leases will not take effect until next fall. Conservancy spokeswoman Connie Prickett said some land along the Hudson—including the takeout at the Indian River—is not leased the public and will be open to the public earlier. 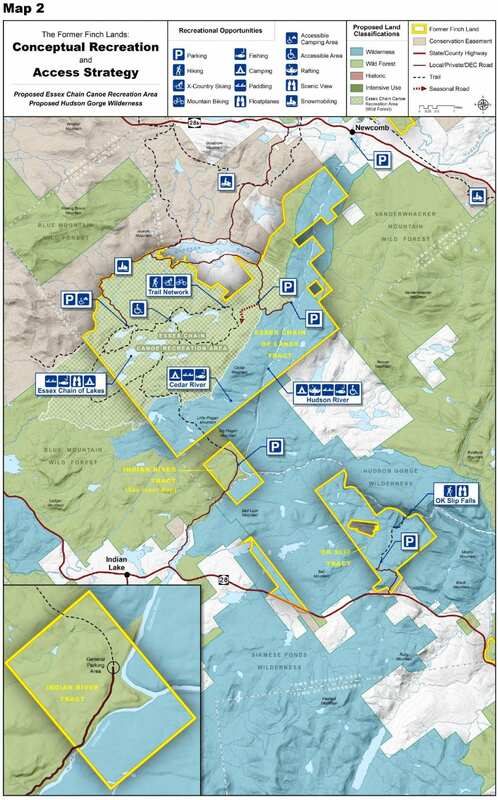 Boreas Ponds, 22,081 acres that includes Boreas Pond, Boreas Mountain, and Ragged Mountain. MacIntyre Works, 11,950 acres, including ten miles of Hudson shoreline and 13.5 miles of Opalescent River shoreline. 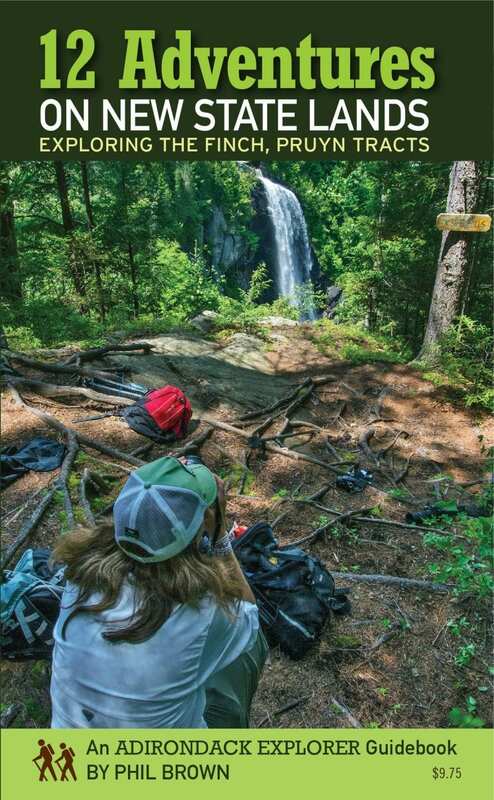 Southern & Smaller Parcels, 15,865 scattered parcels, including OK Slip Falls, the tallest waterfall in the Adirondacks, and two miles of Hudson shoreline. Richards said DEC doesn’t know which lands will be purchased next. 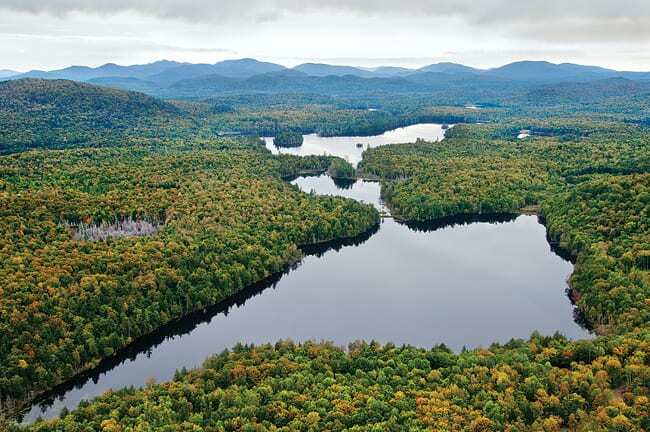 Click here to read a detailed account of the Finch, Pruyn deal in the September/October issue of the Adirondack Explorer. Dec should provide deatailed access and usage plans including classification. Before the acquisition. No one knows for certain what the usage intentions are going to be. The plan should be a contract with the taxpayers of NYS! Don’t stand for all the secrecy! Peter, they should do that before any purchase is made. Otherwise the estimates and expected results from the purchase are just a guess. This should have been done long before they made any deal with the TNC (or anyone else). How can you make any of these economic projections without knowing what the plans are. Governor Cuomo shows the same hatred and contempt that his father showed towards the Adirondacks, its people, its natural resources, and its environment. With purchasing the Finch/ Nature Conservancy lands he totally ignored the wishes and concerns of our local elected governing officials and the local residents. Instead he chose to destroy over 300 jobs, 200 sportsmen camps, and the economy of the local towns and villages. He chose to destroy all wildlife habitat and fishery, aquatic life on 69,000 acres of lands and waters. Instead of keeping these lands in active state forest managed lands with wildlife habitat, forest management, and jobs, economic benefits; he damned these lands and waters to eternal destruction. We have all seen the lack of habitat on forest preserve lands. 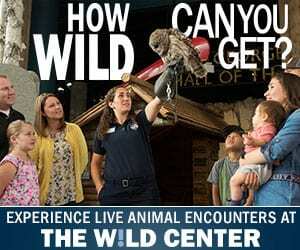 Wildlife is left to starve and die without food and shelter. Over 3,000 bodies of water have been poisoned, silted, and all aquatic life, including our native brook trout murdered into extinction. Cuomo will now add another 175 lakes to this list. There will be no fish stocking, as each year we see DEC fishery and hatchery staff deleted, less fish being raised, and less waters stocked. Additionally, as we have seen in every UMP, the vast majority of the people will be banned from these lands. Sportsmen, disabled veterans, handicapped, elderly, and other outdoor recreationists will be denied access. These lands and waters , as we have seen with existing forest preserve lands, will become morgues with no wildlife, polluted waters, and no access. All motorized travel will be banned; no snowmobiles, ATV’s, ORV’s, motorboats; as we have seen with road closures, etc. in every UMP to date. Claims by the state to otherwise are a lie, as history has shown us. Cuomo lies when he says he supports job growth, industry, and business, and this proves it. The time is long overdue for the sportsmen, local citizens, veterans, handicapped, elderly, and others to demand our elected officials take action to protect our communities. It is time to demand legislation that restricts forest preserve lands to those lands above 3,000 feet elevation. Time to demand active management of all state owned lands, including all forest preserve lands, for wildlife habitat and forestry products. Time to remove Cuomo and all other eco-terrorists supporters from office. RETRACTION. I now support this State Land purchase. hey there and thank you for your info – I’ve certainly picked up something new from right here. I did however expertise some technical issues using this site, as I experienced to reload the web site lots of times previous to I could get it to load correctly. I had been wondering if your web hosting is OK? Not that I’m complaining, but sluggish loading instances times will often affect your placement in google and could damage your high-quality score if ads and marketing with Adwords. Well I’m adding this RSS to my email and can look out for a lot more of your respective interesting content. Make sure you update this again very soon..